Rain reduces corn stalk quality several ways. Photo credit Troy Walz. 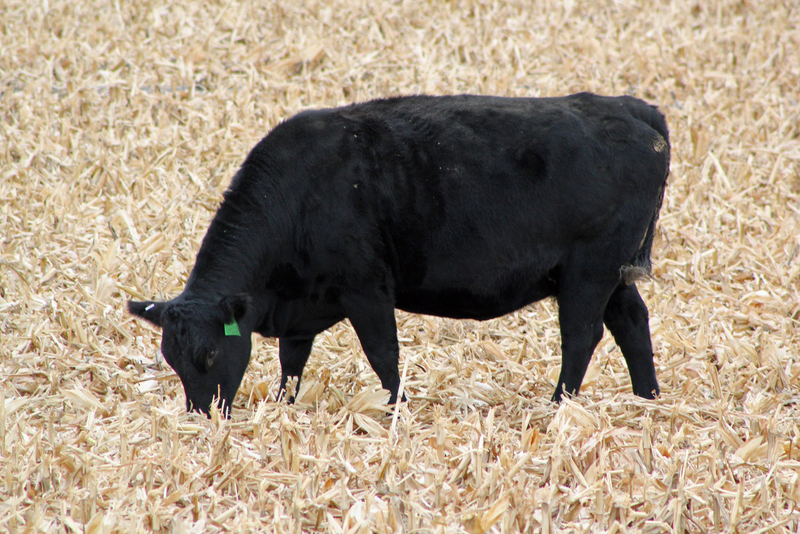 But rain also reduces the feed value of corn stalks in fields that were already combined, and even on standing stalks. This fall many fields have had some pretty heavy rain and snow on those stalks. Rain reduces corn stalk quality several ways. Most easily noticed is how fast stalks get soiled or trampled into the ground when fields are muddy. Less noticeable are nutritional changes. Heavy rain soaks into dry corn stalk residue and leaches out some of the soluble nutrients. Most serious is the loss of sugars and other energy-dense nutrients, which lowers the total digestible nutrients (TDN) or energy value of the stalks. These same nutrients also disappear if stalks begin to mold or rot in the field or especially in the bale. Then palatability and intake also decline. There is little you can do to prevent these losses. What you can do, though, is begin to supplement a little earlier than usual. Since weathering by rain reduces TDN more than it reduces protein, consider the energy value of your supplements as well as its protein content. Weathered corn stalks still are economical feeds. Just supplement them accordingly.